Home page > Portfolio > Restaurant Cruise is heated by the infrared panels Teplov! Restaurant Cruise is heated by the infrared panels Teplov! A really good restaurant is always thought over to the details. In this case heating of the restaurant plays the important role in it’s arrangement, because the comfortable conditions and “atmosphere” of the establishment helps to make fall in love the client even before the moment, he tastes the dish. The system of the heating for the restaurants can be autonomous or connect to the central boiler station. The heating of the restaurants is desirable to organize to the beginning of colds, for the possibility to adjust the system, to test it and prevent the budget for the heating at the fall of air temperature in the cold period of year. The installation of the heating system in the restaurant requires the professional approach, because you shouldn’t to forget that such establishment – is social and should be safe for visitors and responds to norms of the legislation. Also any owner absolutely wants to cut the costs for heating that means it should to worry about energy saving characteristics of the system. The market of the heating systems propose different variants of saving money on the heating of the restaurants – installation of the enumerators, thermo regulators, more economical sources of heat in comparison with traditional and even the using of the alternative sources of energy for getting the warmth. The price of the comfort also will depend on outdoor temperature and the amount heat loss which is usually in the premise of establishment. The heating of the restaurants should be constant, but easily regulated on zones and dependently from time of day. For quick installation of heating system, it’s necessary to choose heaters, which are easily mounted and connected to the system without getting of previous permissive documents and checkings. The heaters for restaurants – are the electrical convectors and also infrared panels are popular and comfortable variant for fast providing the necessary level of temperature in the premise. However there is a considerable difference between them, which first of all influence on the cost effectiveness of the system. The heating of the restaurant with the help of infrared heating system is providing by heat rays, which heat the definite zone and subjects, which are on its territory. The absorbing warmth is remains longer in subjects and slower transfer in the air. The infrared heaters for the restaurants are profitable purchase, because in such establishments people are constantly in the contact with the surrounding objects (these are: table, chairs, utensils) that means could directly feel the warmth. The effect of absorbing the heat by surfaces also lead to 98% of consumption energy by heaters go away on the qualitative heating and doesn’t flew away with the air. In autumn such heating is possible to use for the providing of qualitative heating of the summer playground. The ceiling’s infrared heaters Teplov passed the certifications in Ukraine and EC and are absolutely safe for man’s health. Just that’s why infrared heating systems from Teplov are popular in many cities of our country. 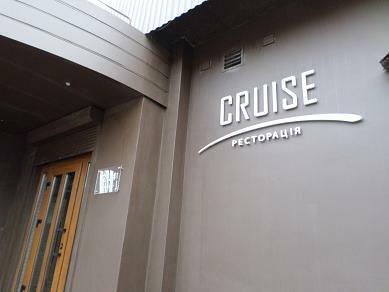 Recently we have finished the installation of heating system in the restaurant Cruise. The stylish heaters Teplov are ideally fit in the establishment’s interior. We used heaters for heating of the places where the clients will rest and some installed for creation of “heat curtain” in the places where are the biggest heat losses. This helps to cut the costs and doesn’t vent the heat from the premise to outside. For the detail information about the work and for the calculation of infrared heating system for your restaurant or café you may address on the contacts noted on our site.